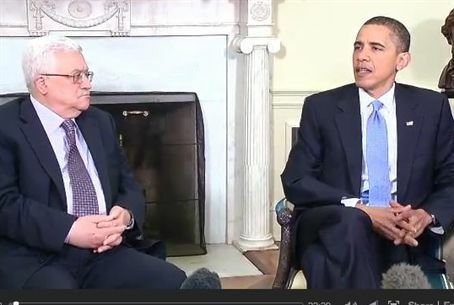 Cordial Obama-Abbas meeting in Washington, reiterating the need for an end to Israel’s blockade of Gaza. Abbas: We don’t incite against Israel. “The situation in Gaza is unsustainable – [as is] the status quo in the entire Middle East.” So said U.S. President Barack Obama after meeting with Palestinian Authority chairman Mahmoud Abbas in Washington on Wednesday. See video below. “It seems to us,” Obama later explained, “that there should be ways of focusing narrowly on arms shipments, rather than focusing in a blanket way on stopping everything and then in a piecemeal way allowing things into Gaza.” He did not elaborate on how “focusing narrowly on arms shipments” would stop arms arriving as hidden contraband smuggled in among food and medicine supplies.